The STR12, an older marine VHF from ITT Marine, can be modified quite easily with a discriminator output for the reception of AIS. 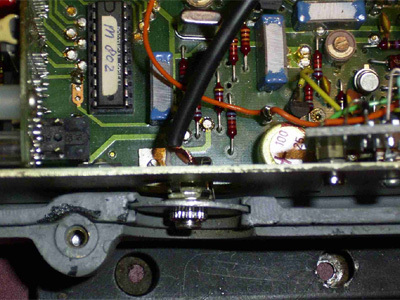 The receiver IC, an SL660C, can be found on the left side of the circuit board. To reach the IC, the outside and inside covers have to be removed. The unfiltered audio can be found on pin 8 of the SL660. Connect a 10 k resistor, a 2.2 nF ceramic capacitor and a 10 uF electrolytic capacitor as shown on the picture. 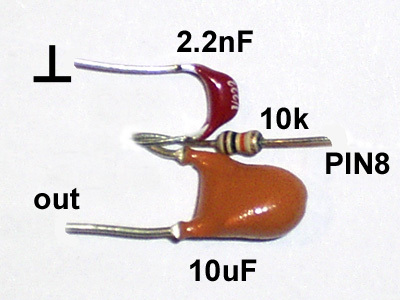 The plus pole of the 10 uF capacitor is connected to the resistor and the 2.2 nF capacitor. 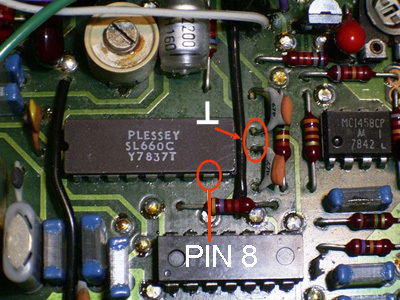 Connect the shield of this wire to ground, together with the free lead of the 2.2 nF capacitor. 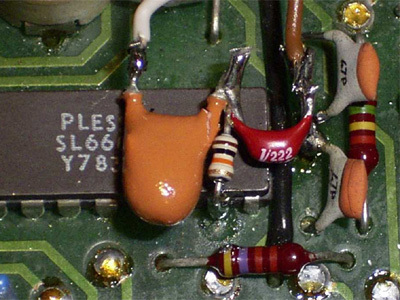 The two 47 pF capacitors next to the SL660 are a suitable ground point. The chassis socket can be mounted in the cover plate of the unused right input. Use some hot glue to fix the cover plate.